Carbon monoxide (CO) is a colourless, odourless, tasteless, poisonous gas produced by the incomplete burning of carbon-based fuels, including gas, oil, wood and coal. Carbon based fuels are usually safe to use, however, when the fuel does not burn properly, excess CO is produced, which is poisonous. When CO enters the body, it prevents the blood from bringing oxygen to cells, tissues, the brain and organs. You cannot see it, taste it or smell it but CO can kill quickly with little warning. Around 50 people die every year from CO poisoning caused by gas, oil and solid fuel appliances and flues that have not been properly installed, maintained or that are poorly ventilated. Lower CO levels that do not kill immediately can cause serious harm to health if breathed in over a long period. In extreme cases paralysis and brain damage can be caused as a result of prolonged exposure to CO. Increasing public understanding of the risks of CO poisoning and taking sensible precautions could dramatically reduce this risk. Never take a BBQ into a building or tent when it is still warm. When the embers have nearly died down, the BBQ will produce very large amounts of carbon monoxide! Does the HSE recommend the use of carbon monoxide alarms? 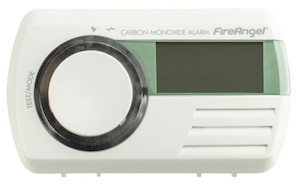 The HSE strongly recommends the use of audible carbon monoxide (CO) alarms as an important precaution but they must not be regarded as a substitute for proper installation and maintenance of gas appliances by a Gas Safe Registered engineer. Before purchasing a CO alarm, always ensure it complies with British Standard EN 50291 and carries a British or European approval mark, such as a Kitemark. CO alarms should be installed, checked and serviced in line with the manufacturer’s instructions. Please note: You can be particularly at risk from CO poisoning when you are asleep, because you may not be aware of early CO symptoms until it is too late. Having an audible CO alarm could wake you and save your life. Visit your GP urgently and tell him / her that you believe your symptoms may be related to carbon monoxide poisoning and request either a blood and / or breath sample. Most CO alarms currently last between 5 and 7 years. Quite a lot of CO alarms also do not warn you when they reach the end of their life, which means that they could be entirely useless while giving the impression of protection. Safelincs offers a FireAngel CO alarm that has a sensor life of ten years, a battery life of ten years and a ten year guarantee! The alarm also gives a warning when it reaches the end of its useful life. 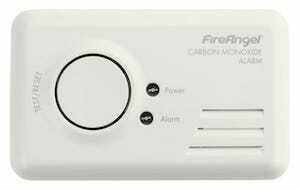 If you wish to not only receive a warning in case of excessive carbon monoxide but an actual readout, even at low CO levels, choose a digital CO alarm such as the Fire Angel 9D pictured here. UK Fire Service Resources recommends Safelincs Safety Products for all your Carbon Monoxide Alarms.